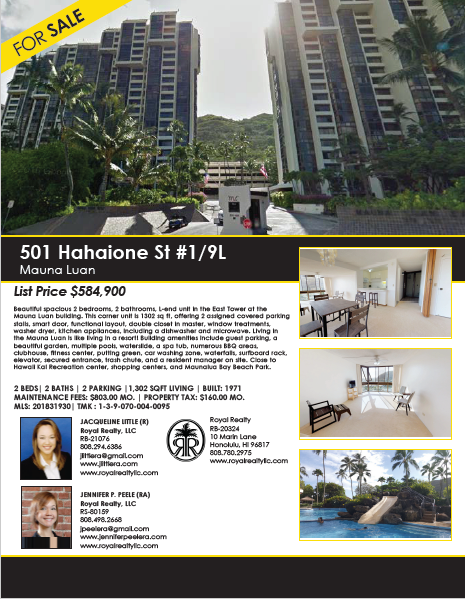 Beautiful spacious 2 bedrooms, 2 bathrooms, L-end unit in the East Tower at the Mauna Luan building. This corner unit is 1302 sq ft, offering 2 assigned covered parking stalls, smart door, functional layout, double closet in master, window treatments, washer dryer, kitchen appliances, including a dishwasher and microwave. Living in the Mauna Luan is like living in a resort! Building amenities include guest parking, a beautiful garden, multiple pools, waterslide, a spa tub, numerous BBQ areas, clubhouse, fitness center, putting green, car washing zone, waterfalls, surfboard rack, elevator, secured entrance, trash chute, and a resident manager on site. Close to Hawaii Kai Recreation center, shopping centers, and Maunalua Bay Beach Park.